At Quality Jam, I had the opportunity to moderate an excellent panel discussion about the impact of Agile development on testing. The panelists for this session were Michael Cooper, Chief Quality Officer for Healthcare IT Leaders, Elise Carmichael from Mobiquity and Fred Furia from SevOne. You can watch the full session below. Quality is everyone’s responsibility. In agile teams, the line between testers and developers has blurred. Everyone on the team has an important role in making sure the applications work for the end user. Testers are still needed. There is a popular myth that agile teams don’t need testers. Nothing can be further from the truth. 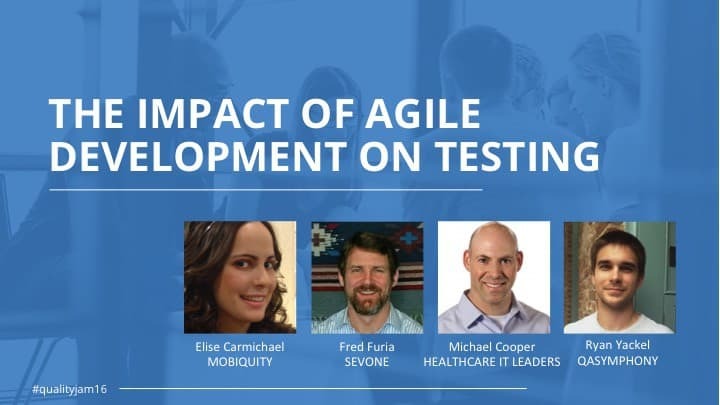 Agile teams need testers more than ever because they need the testing experience and expertise in the agile process. The best testers are focused on the end user experience. While technical testing expertise is important, the panel agreed that the best testers are able to view an application through the lens of an end user. When interviewing to hire a new tester, you have to make sure that candidate is able to see how show the connection between the user experience and the testing. Think about the business impact. Testers need to think more broadly about the impact of software defects and how they can affect the business. Defects that can significantly impact revenue need to be prioritized over issues that would be considered a minor annoyance to the end user. Documentation is critical. Testers need to provide evidence that they actually did the testing. Tools that help with the traceability and documentation are critical, especially in regulated industries. Looking for more great sessions from Quality Jam 2016? You can view all the presentations here.